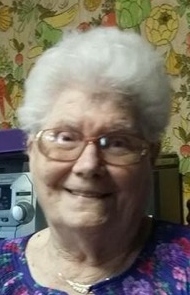 Edna P. Sheesley, 92, of Bennetts Valley Highway, Penfield, PA, died Saturday, February 9, 2019 at Christ the King Manor of DuBois, after a lengthy illness. A daughter of the late Mervin and Amelia (Steven) Long, she was born in Munster on July 13, 1926. Besides her parents, Edna was preceded in death by: her husband Gaither D. Sheesley in 1983; a son, Rodney Good; five brothers, David, Elmer, Forest, Leonard and Homer Long; and four sisters, Florence, Mary and Bessie Long, and Frieda Paul. She is survived by: four children, Rena (Larry) Kachinski of West Pittsburg, PA, Paula (Jay) Peterson of Seminole, TX, James (Lori) Cramer of Indiana, PA, and Gay (Elic) Bellotti of Penfield, PA; seven grandchildren; seven great-grandchildren; a sister, Stella (LeRoy) Lyons of Warren, OH; and numerous nieces and nephews. Edna was very outgoing and personable, being found Polka dancing or helping out many charities through the years. She was known for friendly conversation and treating people as family, especially with her cooking, baking and crocheting. She had lived many years in Uniontown before coming to Penfield in 1967 and has spent the past three years at Christ the King Manor. Visitation will be held on Wednesday, February 13, 2019 from 3 – 6 p.m. at the Ralph M. Geer Funeral Home of Penfield, PA.
Funeral Services will follow the visitation at 6 p.m. at the funeral home. Burial will take place in Hillsdale, PA, next to her husband. Online condolences will be accepted at www.nedzafamilyfuneralhomes.com.